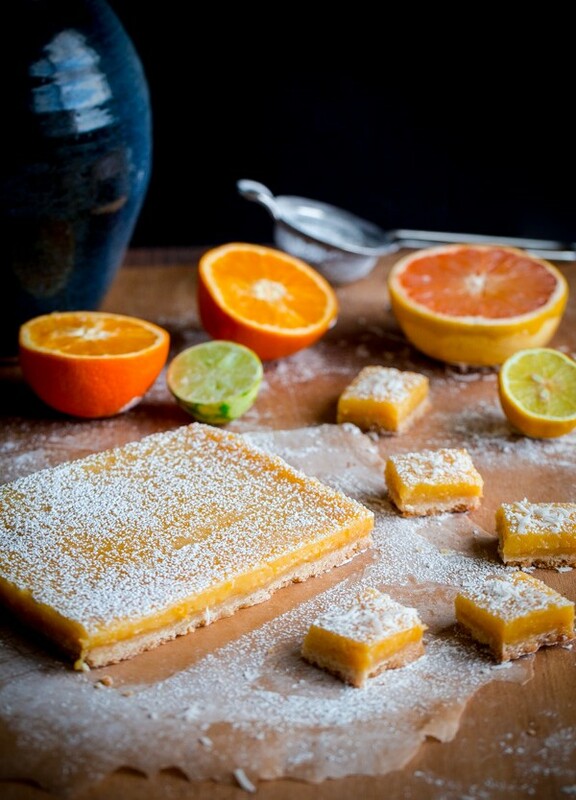 Ok, I fully intended on sharing these bars with you next week for Mother’s Day, but I have another citrus-themed dessert planned for next week as well (oh and a fun giveaway, so stay tuned! ), so today it is. It was either that or tell you about a salad, which is a pretty exciting salad, but a salad nonetheless. It’s Friday! We deserve dessert. 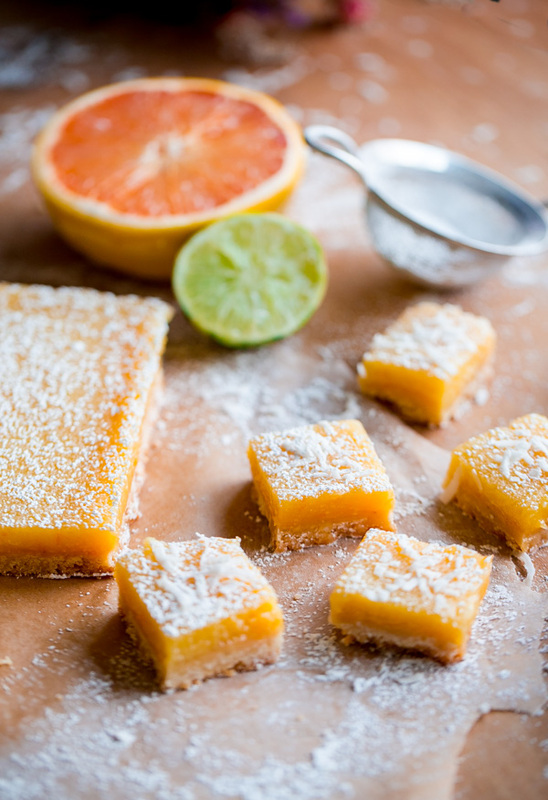 If you’re wondering what the heck four citrus coconut shortbread bars are (and why they look so similar to a classic lemon bar), let me tell you. They are, in fact, very similar, but have a few key differences! Firstly, these bars are made with (if the title was not obvious enough) four different citrus juices! 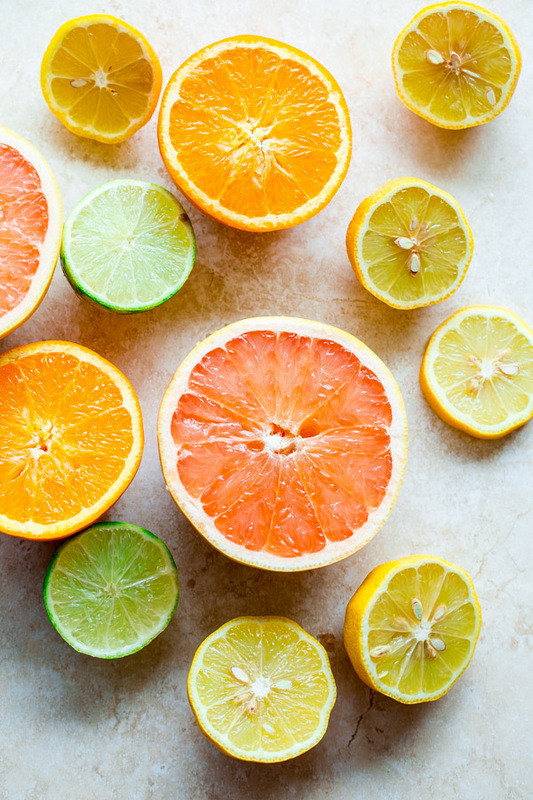 Lemon, grapefruit, orange, and lime juice. The dominant flavors are lemon and grapefruit, but they each contribute varying levels of sweetness and pizzazz (did I just say that?). Secondly, the curd layer is placed on top of classic shortbread layer that contains unsweetened shredded coconut! Oh, and the curd also has coconut oil in it as well, but I’ll explain that a little bit later. The coconut flavor is subtle, but one of my favorite things about these bars. Classic lemon bars were probably one of the first desserts I ever made as a kid. I was (and continue to be) a citrus freak growing up. I used to take a wedges of lemon, and literally eat them. Sparkling water with about three or four lemon or lime wedges was my favorite beverage of choice, and when we went on road trips to Hilton Head Island every summer, my mom would routinely pack a few lemons in the car in case we needed them. It didn’t take me long to realize that most lemon bars did not contain nearly enough lemon juice, and were way, way too sweet. I routinely changed the recipe to contain about 1/4 cup more lemon juice than the recipe called for. Ironically, lemon bars were also one of the first desserts that Connor and I made together so many years ago! It was a very, let’s call it, memorable experience. We had just finished pressing down the shortbread layer, and Connor was tasked with whisking together the citrus ingredients. Somehow, he ended up confusing several different ingredients, and added about 5 or 6 tablespoons (!) of baking soda (first offense: it was supposed to be baking powder, second offense: I’m pretty sure the recipe called for maybe a half teaspoon), which resulted in a 3rd-grade-science-volcano-project-like explosion all over our kitchen counter. Thankfully, the mistake was fairly obvious and we put together another batch, which–as a result of my distraction from the previous incident–I poured directly on top of the uncooked shortbread layer, which I had completely neglected to put into the oven. At that point, I think I decided to just give up and call it a day (and Connor and I have not baked together since). 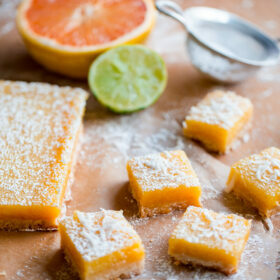 Thankfully, these four citrus coconut shortbread bars were, unlike that incident, a successful baking experiment! They were heavily adapted from this New York Times recipe, which caught my eye a few months ago. 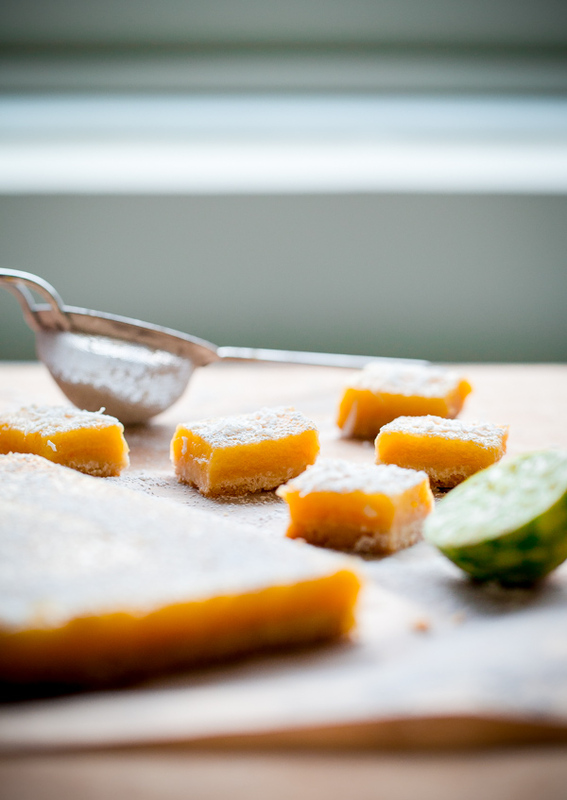 Unlike other lemon bars I’ve made in the past, this recipe uses a curd as the top layer, which requires pre-cooking it on the stovetop before layering it over the cooked shortbread layer. It results in a slightly more even curd layer, and does not yield that slightly crispy (yet more often than not, uneven and slightly unattractive) top layer. In other words, it produces bars that are pretty enough to serve without the need to dust them with a fine layer of powdered sugar! I chose to do this anyway, but feel free to leave this out and sprinkle the tops with toasted or untoasted shredded coconut! Preheat the oven to 325 degrees Fahrenheit. Line an 8 x 8 inch baking pan with aluminum foil (or parchment paper), and grease with baking spray or butter. Set aside. 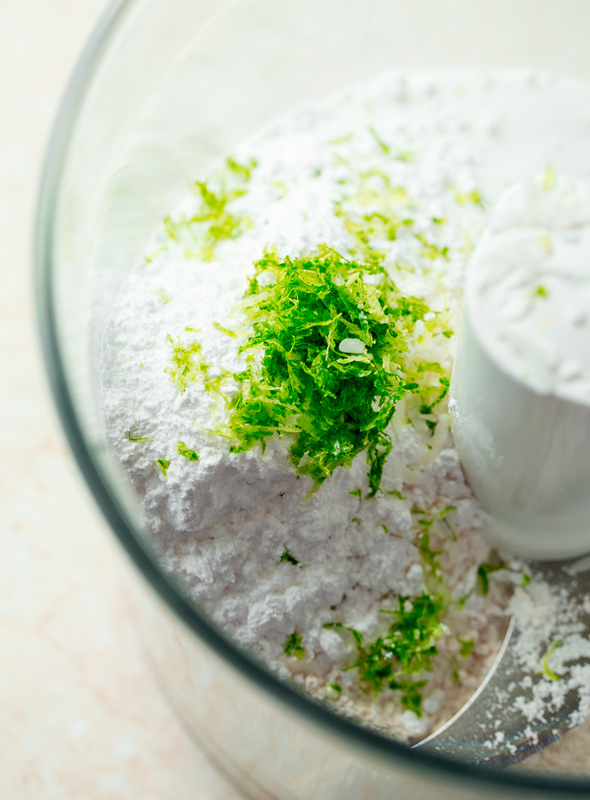 In a food processor, combine the all-purpose flour, sugar, powdered sugar, lime zest, and salt. Pulse until the shredded coconut is evenly distributed into the flour mixture. Add the cold cubed butter, and pulse until the dough just begins to come together. Press the dough evenly (with your hands) into the bottom of the greased baking pan. Bake at 325 degrees (F) for 30 to 40 minutes, or until the shortbread is golden brown. Meanwhile, prepare the curd filling. In a medium saucepan, combine the grapefruit, lemon, orange, and lime juice. 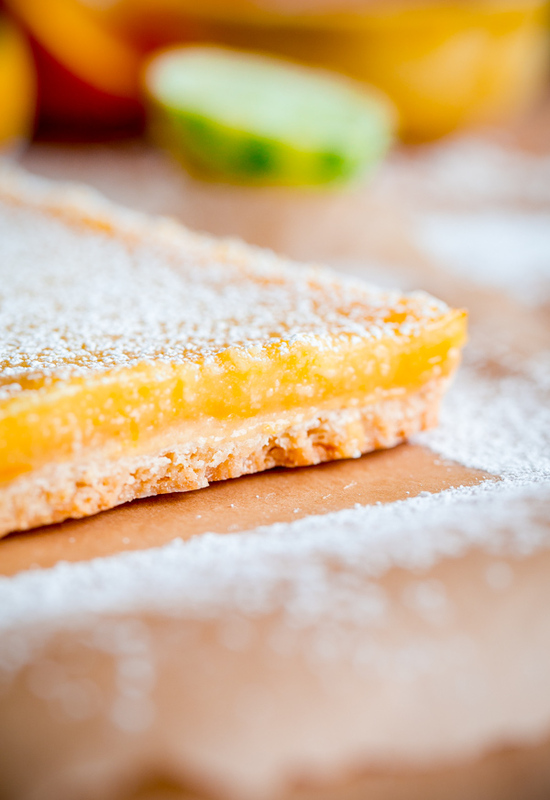 Add the granulated sugar, eggs, egg yolks, and cornstarch, and whisk together. Place over medium-high heat, stirring continously, until mixture begins to thicken–about 3 to 5 minutes. Boil for roughly 1 minute. Make sure mixture comes to a boil so that the cornstarch activates and cooks out. Strain mixture through a fine-meshed sieve into a medium bowl. Whisk in butter and coconut oil until the butter has completely melted, and it is smooth. Carefully transfer curd filling and spread it evenly on top of the cooked shortbread layer. Bake at 325 degrees (F) for 30 to 40 minutes, or until the curd is starting to bubble just around the edges and it is mostly set (it will still jiggle a bit). Transfer to a wire rack to cool completely, then transfer to the fridge to chill completely. Before serving or cutting, sift powdered sugar evenly over the top of the bars. Use a warm (dry) knife to cut into small squares or cubes. 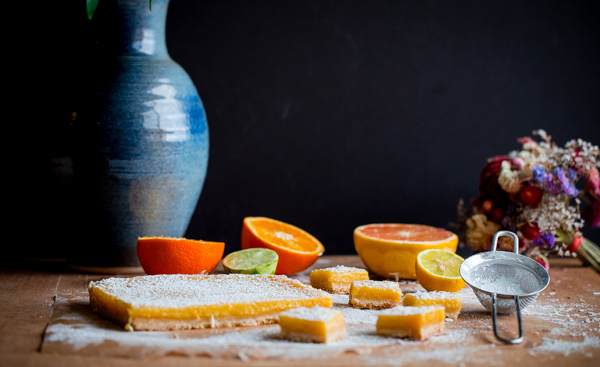 Citrus bars should be stored in an airtight container in the fridge, and will keep for 5 to 7 days. Inspired (and adapted heavily from) by The New York Times.